This early Griffith costume-drama short, like the later “Avenging Conscience,” is a somewhat free interpretation of Poe. A jilted husband seals his wife and her lover behind fresh masonry after discovering them together. Arthur V. Johnson, the heroic husband from “The Adventures of Dollie” stars as the villainous Count (identified as “the King” in the intertitles), and Henry B. Walthall (who we saw in “The Avenging Conscience”) is the hapless minstrel courting his wife (Marion Leonard, an early “Biograph Girl” and star of “A Burglar’s Mistake”). Also in small roles are Mack Sennett, who would soon leave Biograph to start Keystone Studios and Mary Pickford, who was to make many more pictures with DW Griffith. It doesn’t seem to me as if Griffith had much of a knack for atmosphere and dread, but it’s interesting that he tried it more than once. 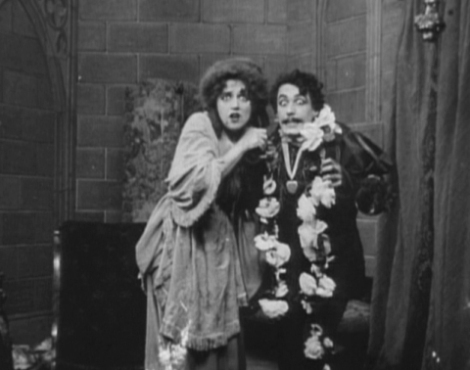 This stands out among early silent films for not having a happy or redeeming ending, and Johnson eats up the scenery as the frenetic nobleman. The editing is comparably simplistic, and there are minimal setups, so this was probably cheap to make.